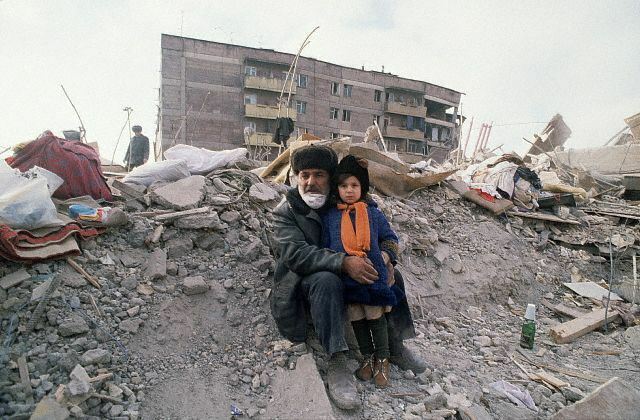 December 7, 2013 marks the 25th anniversary of the Spitak earthquake of 1988. This natural disaster in Armenia killed as many as 50,000 people and injured as many as 130,000 in the northern regions of Lori and Shirak. I wrote this poem in the weeks after the tragedy. All this pain is for which of our sins? points at a map of Armenia. The ceilings drop like eyelids. a fire fueled by broken chairs. like hooks at your skin. in the book at heaven’s door.